Every week, I always tell myself I’m going to get my Harvest Friday post done early and ready to go first thing in the morning. And every week (or every other week, really) it just doesn’t happen. But you know what? I kind of enjoy taking Friday afternoons to really assess and explore the garden, and then to sit down and go through all of our accomplishments. It’s a really fun way to spend Friday afternoon and definitely helps the weekend get here faster. So… here you go… Harvest Friday Afternoon! Guess what! We finally got our hands on a few tilapia. Finally. We only got about 10, which is not as many as we wanted, but at least it’s a start. Wahoo! We also added some more goldfish and algae eaters. The fishies all seem to be doing just fine, so hopefully they will begin growing soon (and pooping more!). Other than a major aphid infestation (which has since been reeled in a bit by another shipment of ladybugs), the plants are doing great. Especially the cucumbers, from which we’ve had a steady harvest– see below. The tomatoes are also growing like weeds. All the way up to the top of the greenhouse. Once they reach the top, we’ll rig them up to have them start growing along the inside of the roof. 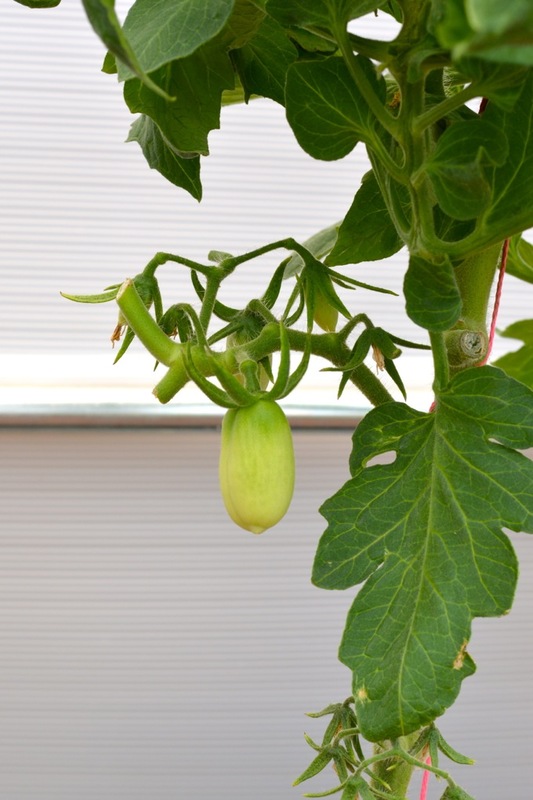 We have two types of tomatoes growing right now. Two of the big plants are Roma plum tomatoes (which we are growing for sauce). 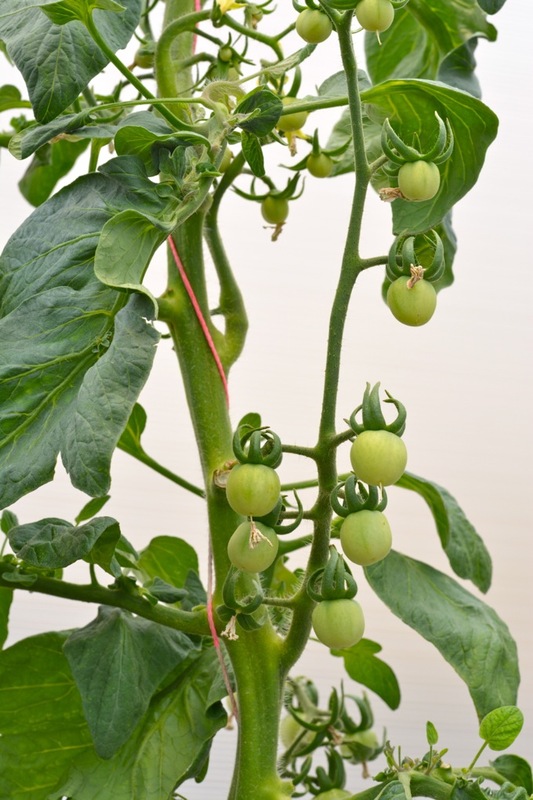 The other two big plants are Galina tomatoes, which are heirloom yellow cherry tomatoes. There are a TON of green tomatoes on the vines. Come on and ripen up, little guys! 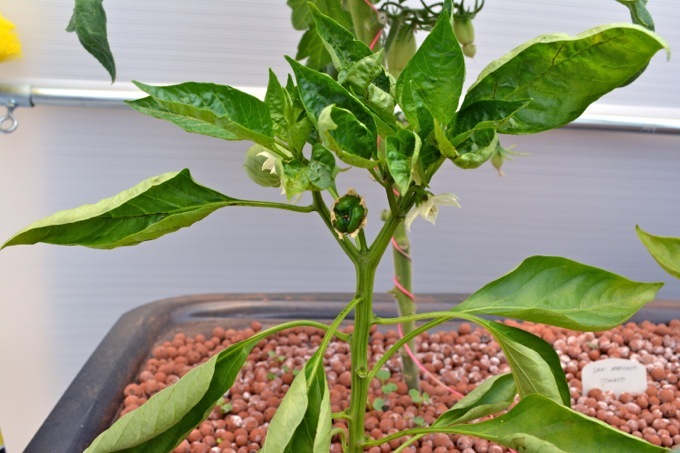 And here is one of our first little bell peppers making an appearance. 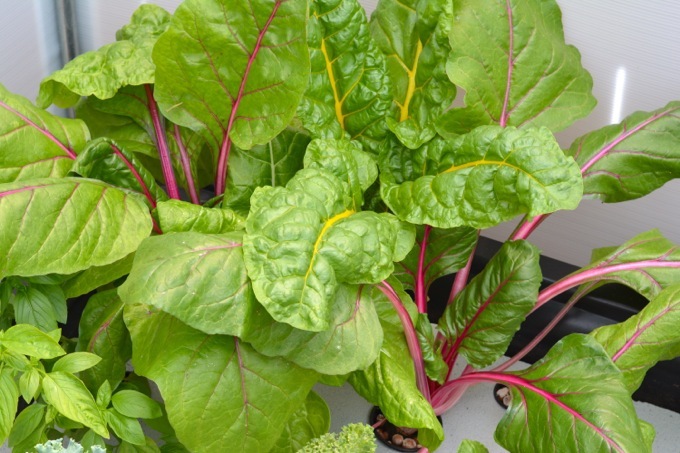 On the greens side, the rainbow chard is really going nuts. There is a ton that’s ready to harvest, but we’ve had so much kale that I haven’t made it to the chard yet. 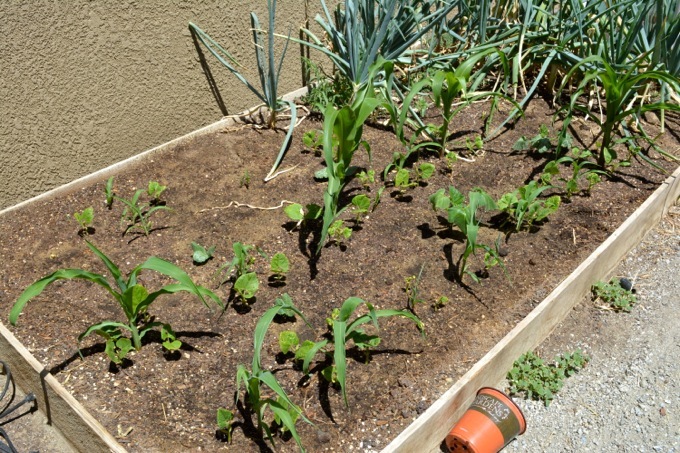 This raft bed is doing really well with romaine (or butter– I forget!) lettuce, cilantro, dill, kale, red lettuce and Thai basil. 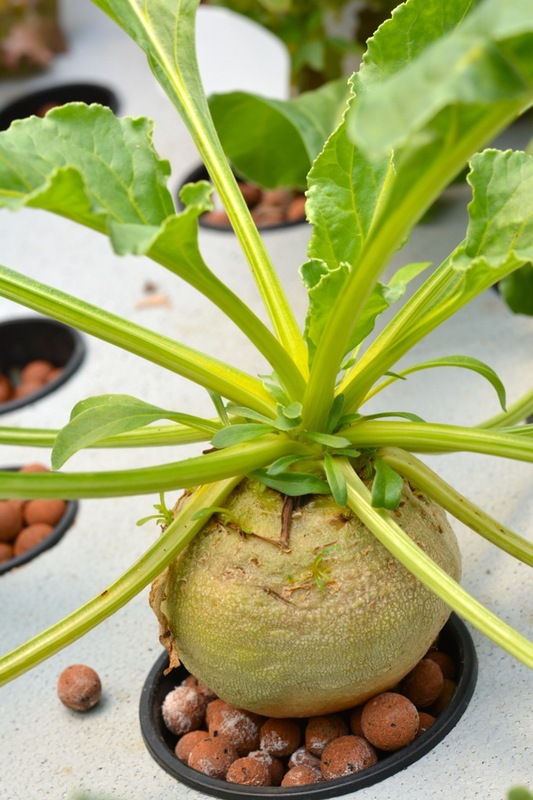 And check out how beets grow aquaponically. Above ground! This one is a golden beet and is definitely ready for the pickin! We’ve got quite a few new things going on in the dirt garden. Inspired once again by Garden Betty, we planted a Three Sisters Garden. You can learn a whole lot more by clicking on that link, but here are the basics: The three sisters are corn, pole beans and summer squash. Growing the three together creates a sustainable ecosystem because the pole beans can climb the corn stalks (therefore you don’t need to trellis them), the beans stabilize the corn (so that the tall stalks don’t blow over in the wind), and the huge, leafy squash plants provide shade for the soil and keep weeds from growing. Plus, beans add a lot of nitrogen to the soil and corn loves nitrogen. This is our first time growing a Three Sisters Garden, so we will see how it goes. We kind of just winged it and I’m not sure whether we’ll have too many, not enough, or just the right amount of plants! Growing corn last year didn’t really work out for us, but we thought we’d try one more time as part of the Three Sisters. Remember how we sprouted a sweet potato? We planted a whole bunch of the sweet potato shoots! 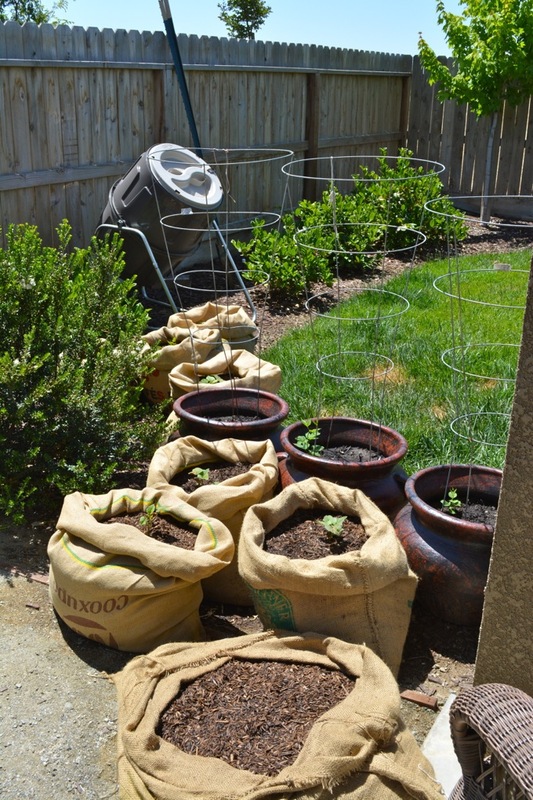 Since we were out of garden space, we ordered a bunch of used burlap coffee sacks (you can find them on Amazon) and are using those for pots. Can’t wait to see how they grow. 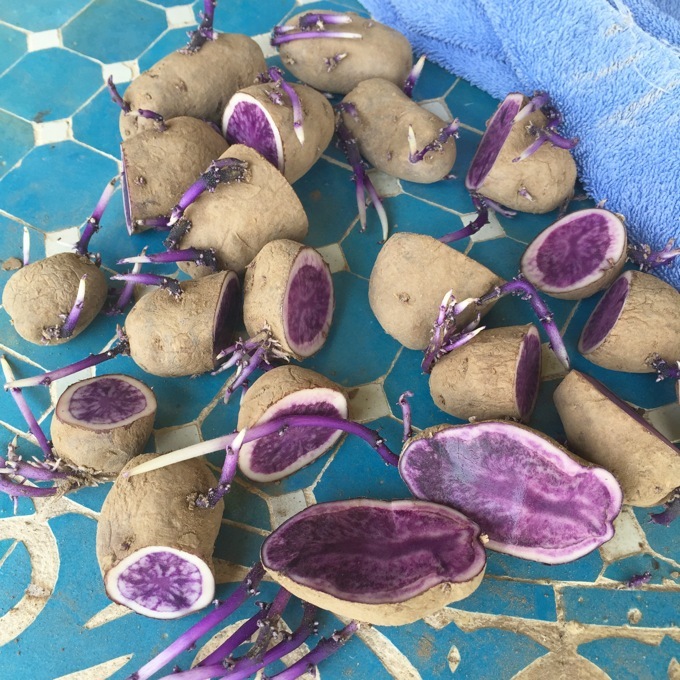 As if we didn’t have enough potatoes already planted, we ordered some of these really fun purple seed potatoes. And those were all planted in burlap sacks as well. 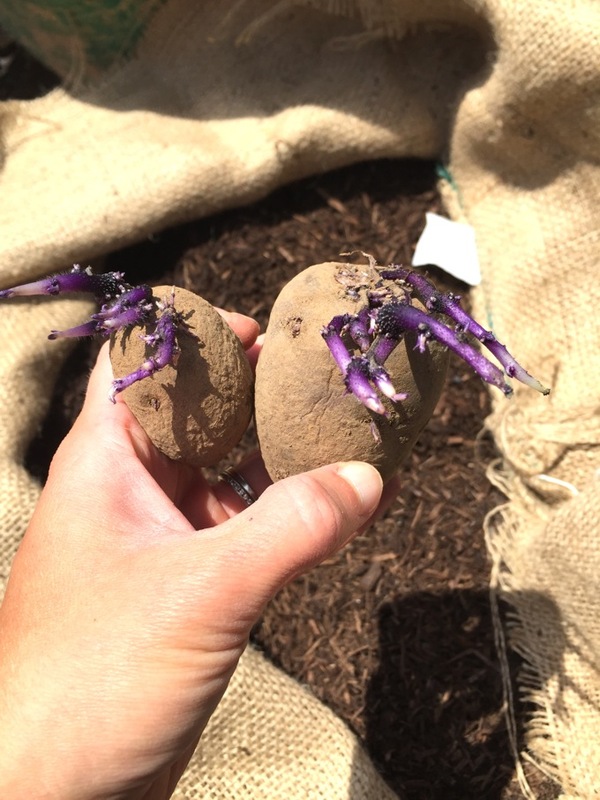 In this post I mention how you want to plant and grow potatoes. 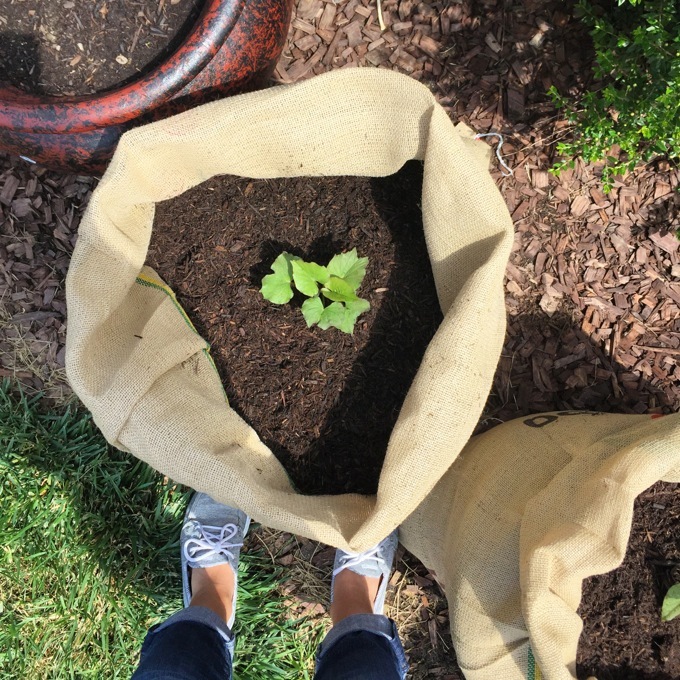 Burlap sacks are really great for using that method, because you can add dirt to the sack as the plants grow. 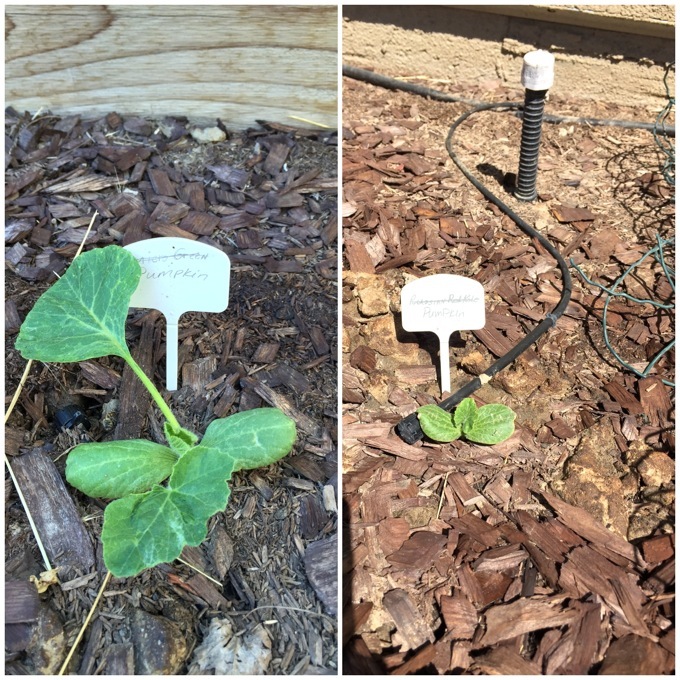 I also planted two pumpkin seeds. But not in the garden! Last year we planted pumpkins and the plants got SO big and took over way too much of the garden. So this year, I planted the seeds randomly out in the yard in areas with lots of room. We’ll have random pumpkin plants just growing in the yard, but who cares. They both sprouted already! Last but not least… this one is kind of a fun adventure. Some of you may know that my hubby is really into brewing beer. He’s been getting especially creative lately, and now he wants to take it a step even further. Growing his own hops! He planted 3 different types of hops and they have all started sprouting. They are supposed to grow into really pretty vines. They’re perennial plants that die off each winter and then come back. We are eventually going to put an arbor in our back yard and want to have the hops grow up it. 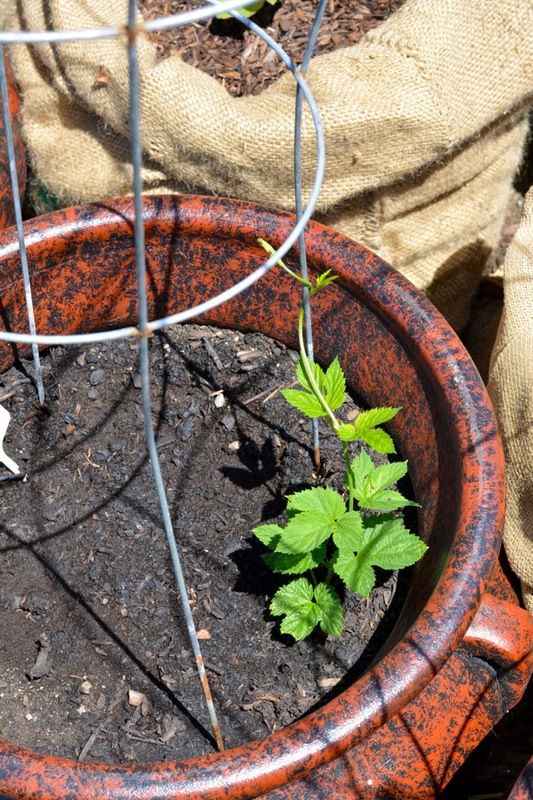 But since we don’t have it up yet, for this year we are just going to let the hops grow up tomato cages. 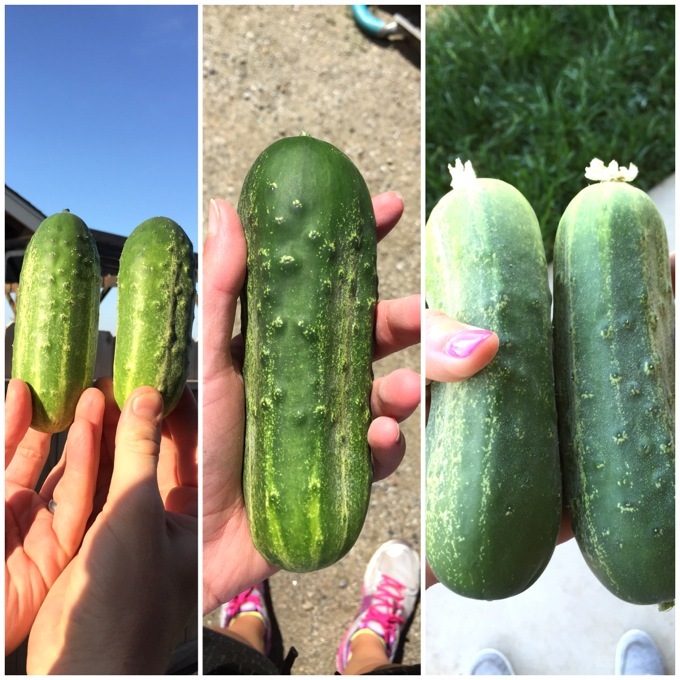 The last couple weeks has been ALL about the cucumbers! They are so, so yummy. They’re technically pickling cucumbers but I haven’t made any pickles yet because they’ve been disappearing as soon as they’re picked! They’re delicious straight up or in a salad. Hopefully these plants will keep producing all summer. 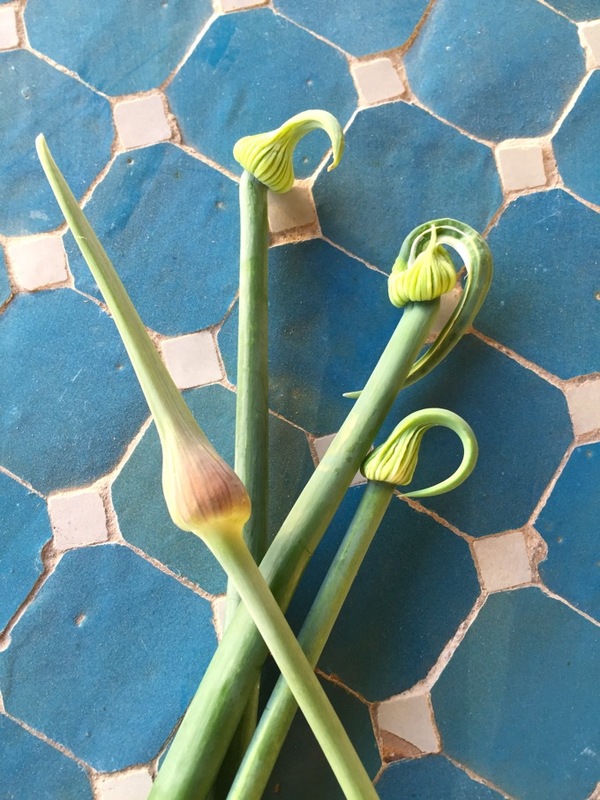 I mentioned in my last HF post that I had a few onion and garlic scapes shooting up. I picked a bunch of them and made a pesto with them! 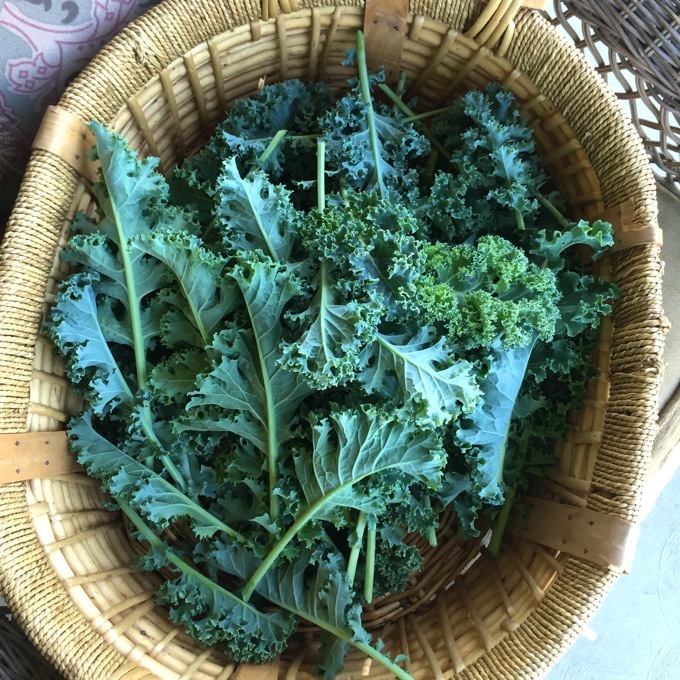 Still getting lots of greens– lettuces and kales. 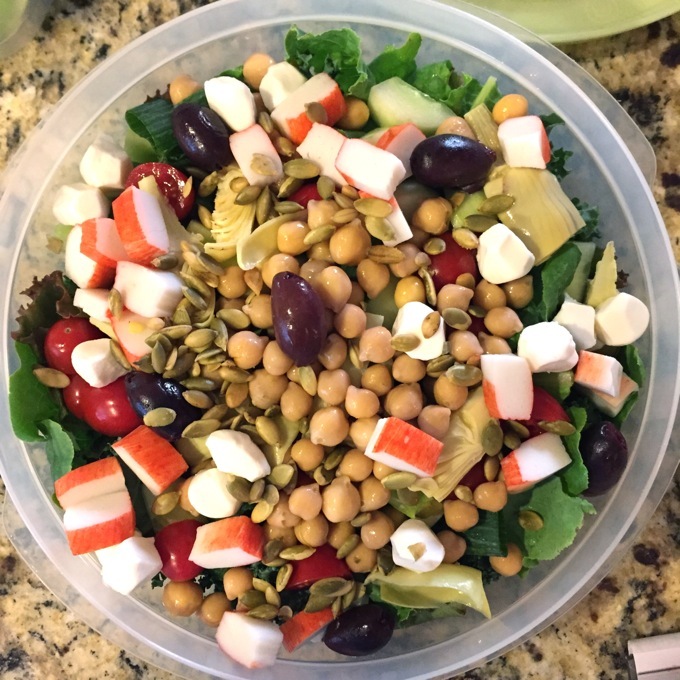 I made this huge salad… times about 10. Some of the kale plants are bolting, starting to suffer in the heat, and getting attacked by aphids. I pulled a few of them up, harvested what leaves I could and composted the rest. 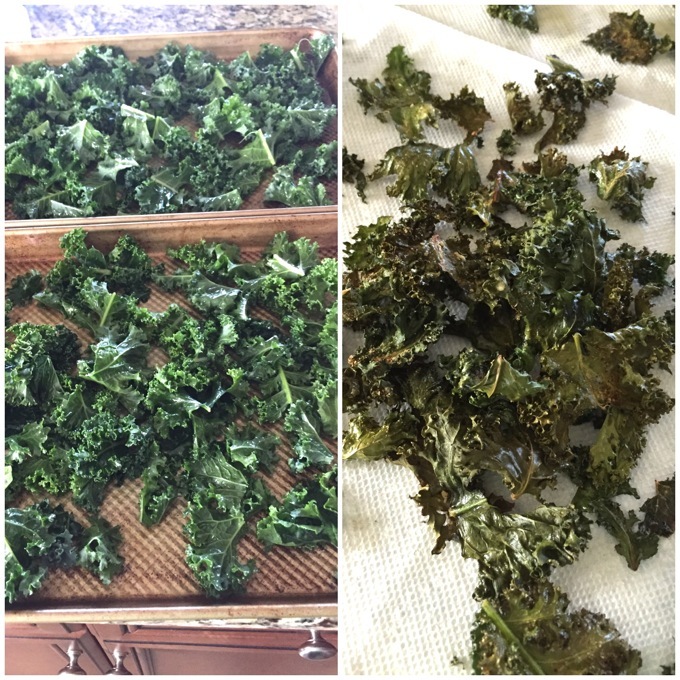 Since I had a whole bunch of leaves, I decided to make kale chips. I used this method and seasoned them with a little salt, garlic powder, cayenne and Parmesan. GUYS! I had never had kale chips before. THEY ARE THE BEST THING EVER! Seriously. So good. I have a feeling I’ll be making some more this weekend while I still have kale around. I could not stop eating them, they have the best crunchy texture ever. Kind of like those weird seaweed chips, but they taste way better. Welp, that’s all I’ve got! Hope you have a great weekend. Be sure to let me know what you’re planting and harvesting this week. And if you want to keep up with my garden more often than just every other week, be sure to follow me on Instagram. Harvest Fridays - Halloween and Leafy Greens! Sounds like you garden is really thriving, Jess! And that’s awesome that you finally got some tilapia. I hope they do well! And those cucumbers look great! I’m sure you’re loving those! GAH! What a GREAT garden Jess! I feel like I’m ‘shopping’ in my own back yard garden. And, those delish cucumbers? They would definitely be going into a pickle jar for me – I am a pickle FANATIC. Love, love, love me some pickles – so send those cucumbers to my house! 🙂 That is, if you can bear to give up any. I love pickles, too!! I’m hoping we get a ton this summer so I can pickle some up! Jess, your garden is AMAZING! I have some things growing in a greenhouse too, but just a regular one. We are about to build some raised beds and transfer the plants to it. That’s awesome that your hubby brews beer – so do we! I love the way hops look when they are growing on vines. We’ve thought of planting some too. What kind are you guys planting? Thanks, Rachelle! 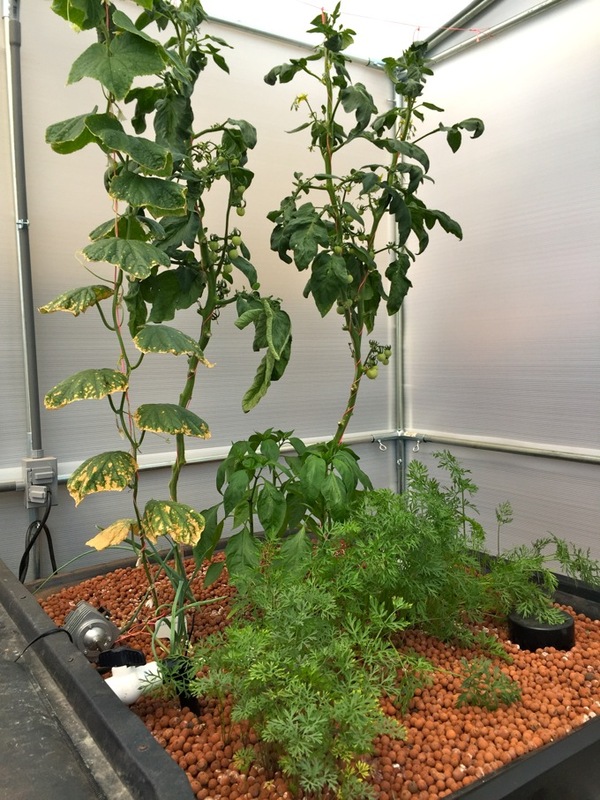 We planted 3 different types– chinook, nugget and columbus! We ordered the rhizomes online, but just found out that our local homebrew shop sells them, too… so we may need to add some more if they do well! 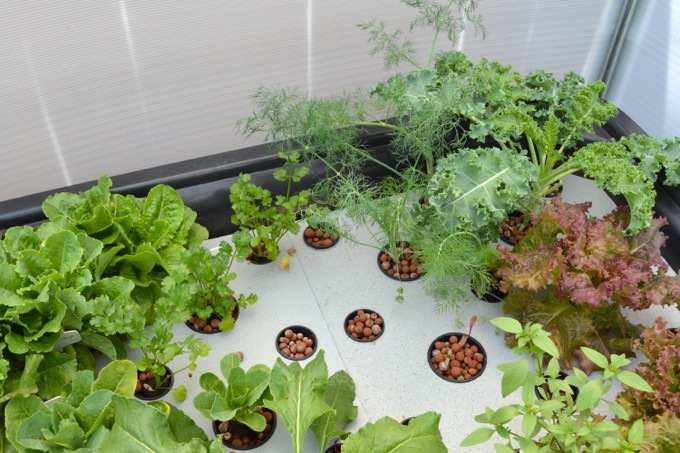 Your garden is seriously just AWESOME, Jess! Share your green thumb over here with me please! I still haven’t gotten mine put in for the summer yet! You have one amazing garden there! How exciting about the tomato plants coming along and that golden beet was the biggest I’ve seen! And I LOVE kale chips, they’re the best things ever! Your garden looks amazing! Yay for tilapia and oh my goodness! Love your cucumber and kale! My mouth is watering! Everything looks perfect! My hubby brews beer too! He’d be so impressed with your hubby growing his own hops! Those cucumbers are amazing, as is your whole garden! Thanks, Katie!! We are hoping the hops produce enough to use this year, but it may take a season or two until there are enough to actually harvest– we shall see! !